Banham post mill was unusual in that it had clockwise rotating sails. The mill was built on the northeast side of the village in Snailsgate Street and it was some time after 1880 that the road name was changed to Mill Road. 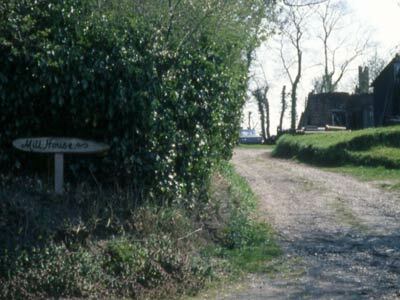 The red brick roundhouse had 9 foot piers that were integral with the 10 foot walls. The 4 double shuttered sails had 7 bays of 3 shutters rotating clockwise, although the innermost pair had an additional two vanes on the leading edge. The buck had a porch and a tailpole with one wheel. 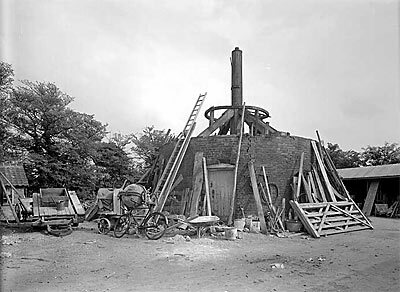 To be Sold, and entered upon at Michaelmas next, a very good Messuage, Baking office, and Windmill, in good Repair, and in full Trade, in Banham and Winfarthing, now in the Occupation of Mr John Tebble, at an old Rent of 22 pounds yearly. Enquire of Mr William Clarke, at Horne, in Suffolk; or of Mr Henry Jacob, at North Elmham, in Norfolk; or of Mr John Crisp, Attorney at Law, at East Dereham, in Norfolk. Lot 1. 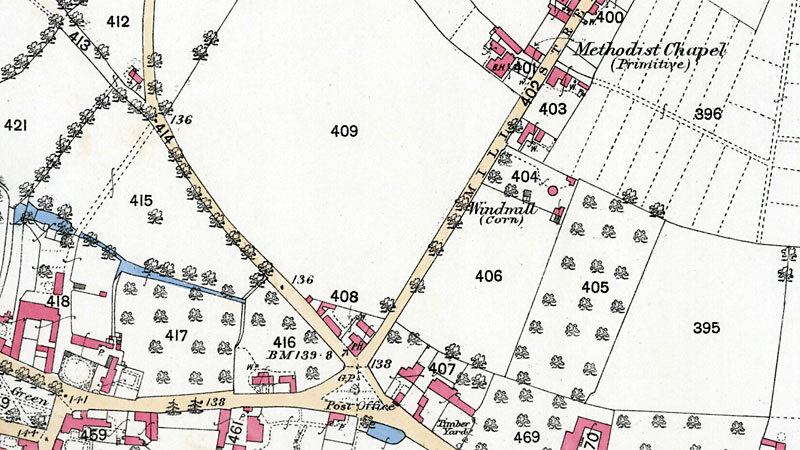 A Capital POST WINDMILL in the occupation of Mr. Thomas Cattermoul and a Dwelling House in three tenaments, garden and hempland containing about half an acre in the occupation of - Coby and others. Lot 2. A Dwelling House, Baking office, barn, stable, garden, orchard and a piece of rich arable land adjoining in the occupation of Mr. Richard Cattermoul. The above Estates are situate in Banham aforesaid. Possession of Lots 1 and 2 may be had at Michaelmas and of Lots 3 and 4 immediately. Unless sooner disposed of by private contract. An ESTATE situate at Banham aforesaid consistoing of an oid established & good accustomed baking office, a capital post windmill in full trade & about 6 acres of rich land adjoining; also a cottage in three tenaments in the occupation of Mr. George Baldry & his undertenants, who will give possession at Michaelmas next. Apply to Mr.Baldry on the premises. by George W. Salter, without reserve. The following property situate BANHAM, Norfolk in one lot comprising a substantially built POST WIND-MILL in good repair with all necessary going gears thereto; also a Cottage near in Two Tenements, with all necessary Outbuildings and large Gardens containing altogether about half an Acre. The above Property is well situated near the town of Banham abutting on the high road leading to New Buckenham and is in the occupation of Mr. Isaac Arms, the proprietor who has for many years there carried on an extensive trade as miller and baker. The Property possesses peculiar advantages both for occupation and investment. Apply to J. C. Calver, Solicitor, Kenninghall and Long Stratton or to the Auctioneer, Attleborough. The mill failed to sell at the August 1854 auction and remained in the possession of Armes family until c.1905. On 9th July 1973 Mrs. H.B. 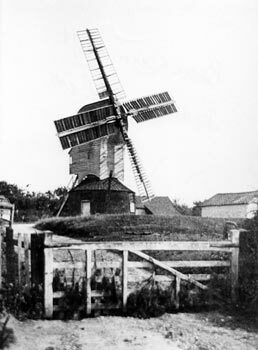 Bailey of New Costessey wrote that she believed the Littleproud family took over the mill when Joseph Armes left in c.1905. In January 2009, Geoffrey Aldridge telephoned Jonathan Neville to provide some additional details of the mill's history. Geoffrey maintained that he did not know anyone who had heard of Edwin Smith who was listed as miller in 1922 and 1925. He also mentioned that after Benjamin Smith received his army call-up papers in 1915, he took little interest in the mill and failed to turn it to wind during the storm that destroyed it later that year. 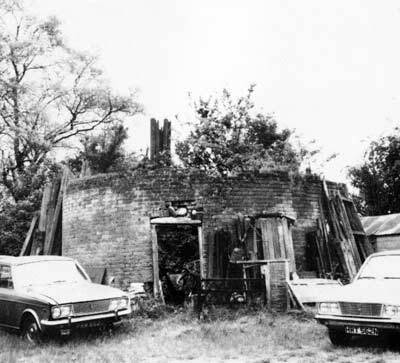 Banham postmill was derelict by 1980 and the roofless red brick roundhouse was being used as a store. However the main post and trestle timbers were still nearby.